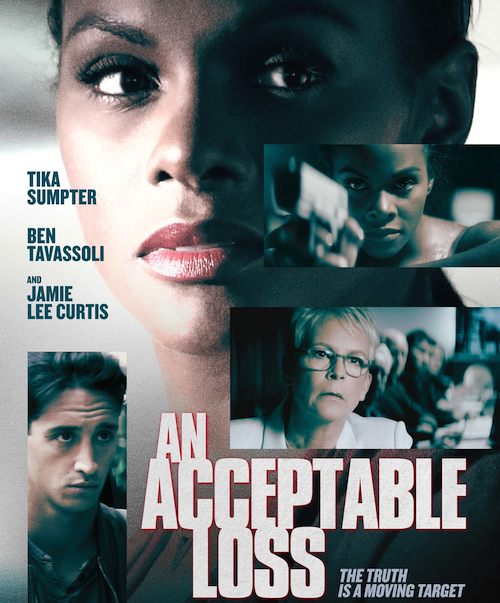 Libby (Tika Sumpter) is a superstar in overseas intelligence, having been the chief advisor to U.S. Vice President Burke (Jamie Lee Curtis) during a confrontation that had the ramifications of September 11th. Oddly, she has opted to forego a plum assignment when the VP is elected President, and accepts an academia role at a Midwestern University. Her role in the previous administration was divisive, and she is not necessarily welcome on campus. One particular grad student, Martin (Ben Tavassoli, in a eerily direct performance), seems intent on bringing the former government bureaucrat down. As the mystery unravels, so it follows that truth may become a victim. In PART ONE of a Podtalk with Patrick McDonald of HollywoodChicago.com, Producer Colleen Griffen and Writer/Director Joe Chappelle of “An Acceptable Loss” talk about themes, coordinating their budget and working together while also being married. In PART TWO, the precise casting of the film is reflected upon, as well as the use of the Chicagoland area for creating atmosphere. The Midwest Independent Film Festival presents “An Acceptable Loss” on Tuesday, February 5th, 2019 (6pm start), at Landmark Century Centre Cinema, 2828 North Clark Street, Chicago. For more information about the Festival, click here.